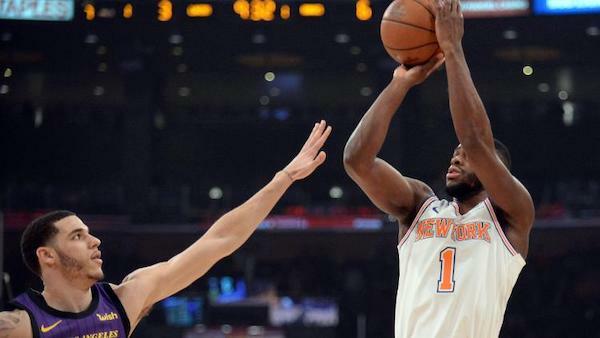 Last week brought more confusion, disappointment, and annoyance for the lowly Knicks, as they continue their west coast road trip. It’s not quite as exciting as when this was Melo’s homecoming, but taking on the (surprising) #1 team in the Western Conference in their home court, the young and tanking Knicks had a chance to make a big statement. Instead, New York lost this game in the most Knicks-like fashion. After leading for three quarters and giving fans a glimpse of false hope, the Knicks did what the Knicks do best and blew it at the end. Let the tank live on. As New York traveled to Lebrongeles, they played a surprisingly good game that resulted in an encouraging-yet-disappointing win. The Knicks and Lakers went back and forth all game. LA entered the 4th quarter up 6, but New York fought back in the end, outscoring LeBron and the Lakers by 13. Even with a win, New York fans are still left with a sour taste in their mouth, after victories by both the Suns and the Cavs widened the race to the bottom. Substituting as starting center, Kornet impressed in his 27 minutes: grabbing 6 rebounds and scoring 19 points on 6/9 shooting of which 4/7 was from 3. Still fighting a nagging foot injury, Hardaway shot an impressive 58.3% from the field, tallying 16 points in the process. Kanter has been averaging a double-double and these past two games have been no less impressive. Coming off the bench in favor of Kornet, the 00 had 33 points and 27 rebounds in 47 minutes. As someone fighting for a starting backcourt role next season, Trier hasn’t helped his case over the past two games. In 28 combined minutes, the undrafted rookie known for his scoring ability put up just 9 total points and 3 assists on 30% shooting. Another young scoring guard looking to secure his spot on next year’s roster, Dotson struggled in his 11-minute outing against Denver, putting up only 1 point from the free throw line on 0/2 shooting. Last week, the Indiana product grabbed double digit rebounds in two games, a positive area of consistency. However, his offensive game has left some production to be desired. Vonleh scored just 12 points in 51 total minutes on 4/14 combined shooting. After a strange 1-1 week against 2 strong Western Conference teams, the Knicks may appear to be on the up. Expect a come back to reality over the next 7 days as they face off against 4 strong teams: the Trail Blazers, the Warriors, the Pacers, and the 76ers. Considering New York only just broke into double digit wins this past Friday, their woes are likely to continue next week.